The title probably confuses most. I am not talking about a pizza made with zucchini on top. 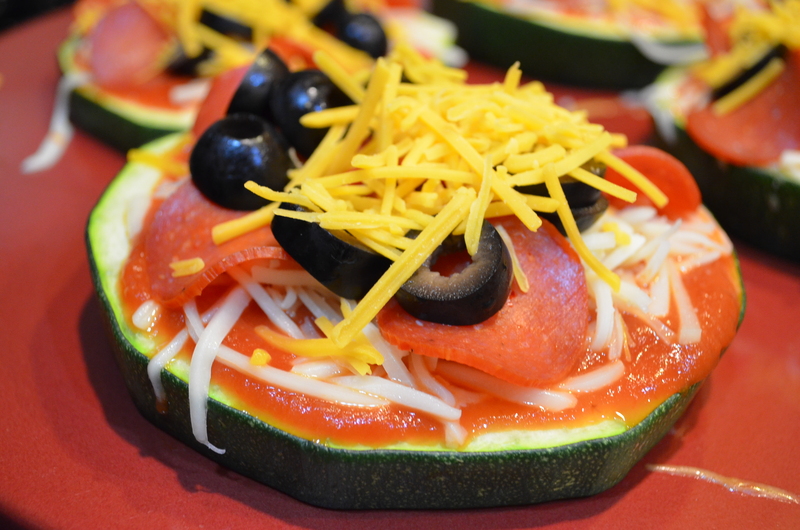 Instead, I am talking about a pizza made where the base/crust is zucchini. Yes, you did read that right. And, no, I am not crazy (promise). 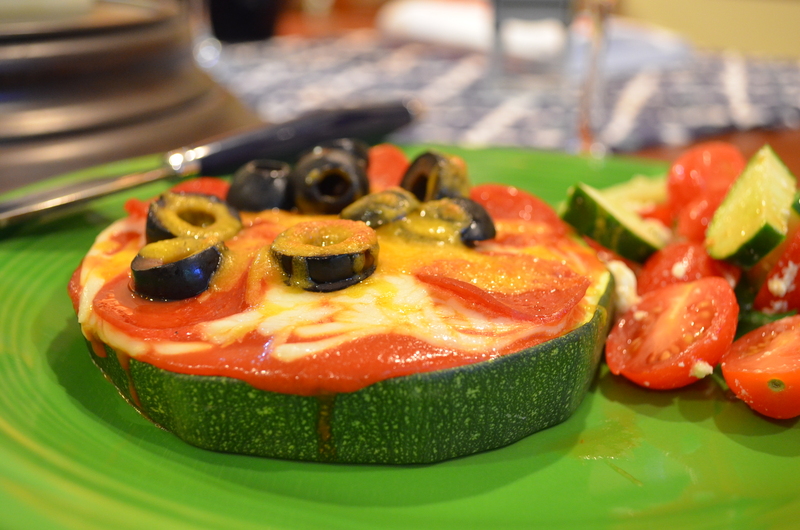 I saw Zucchini pizzas on Pinterest a long time ago and have wanted to make it ever since. The only thing holding me back…finding a zucchini that was large enough. Well friends/family/followers, the time finally came when I found a large enough zucchini! This last weekend when visiting the in-laws, my mother-in-law gave me a zucchini from her garden that was big enough (woohoo)!!! Not only was it home-grown, it was also big. Man, I wish I would have taken a picture of the zucchini before I cut it up. But of course I forgot. This thing was at least a foot and a half long and at the fattest part probably 6+ inches wide. Absolutely perfect for me to test this newest recipe. Like my 10 minute peach pita pizza, this recipe was super easy and fast. Perfect for a night where you need something in a hurry. 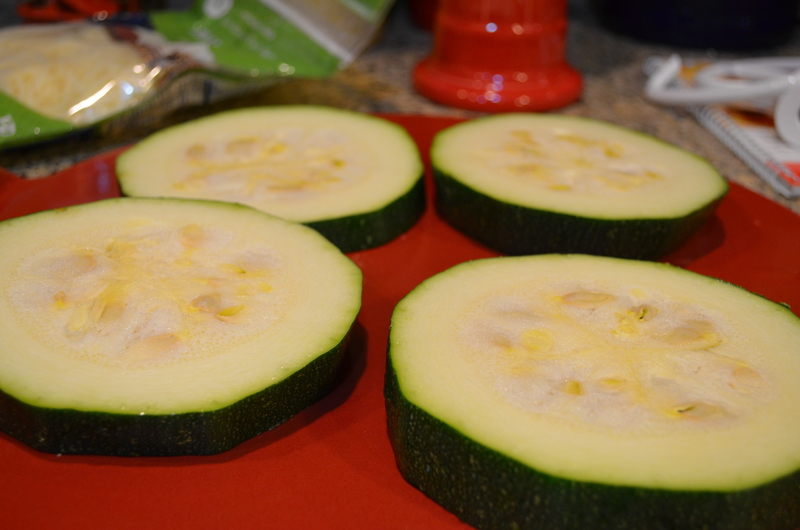 I started by cutting the zucchini into about 1/2 inch thick slices. Next, I chose to place the zucchini slices on a pizza stone and broil them, however, recipes I read recommended putting them on a grill. If the Mr. had been home I might have asked him to head up the grill, however, it was just my good friend Meg and I so instead I chose to broil as it was quick. After about 10-12 minutes I pulled the zucchini slices out as they were just starting to soften and had turned slightly brown on top. Next up was putting the toppings on. I started by spreading about a tablespoon or two of tomato sauce over the zucchini slice. Next, I put a layer of shredded mozzarella cheese (probably 2 or so tablespoons). Then I placed about six slices of turkey pepperoni on top of the cheese, and sprinkled on some sliced black olives. Finally, I topped it with about a tablespoon of shredded sharp cheddar cheese. After all the toppings were put on, I transferred them back in the oven (still on broil) for about 5 or fewer minutes. Just long enough for the cheese to melt. With the pizzas I also served a cucumber, tomato, feta salad. My mother-in-law also sent me home with tomatoes and cucumbers from her garden. All I did was slice the tomatoes and cucumbers up and toss them with a little bit of feta, olive oil and balsamic vinegar. Simple and absolutely delicious! Today is my Friday! Can’t wait for the LONG weekend. Tomorrow is a girl day with my mom. Shopping and golf. Husky Football starts on Saturday and I am beyond excited for that. I do love my Huskies 🙂 We also, have two BBQ’s and a golf tournament this weekend. Like typical Piep style, we will be BUSY. Just how we like it! I do have some cooking to do this weekend so will be back next week with some more exciting stuff (well I find it exciting!). Wow, how has over a week come and gone and I still haven’t posted about the rest of my dinner with the XO ladies? As you can tell, I am still getting used to posting and making a habit of it! 🙂 Sorry for the long delay! So, as I mentioned, I needed two posts to explain this dinner. 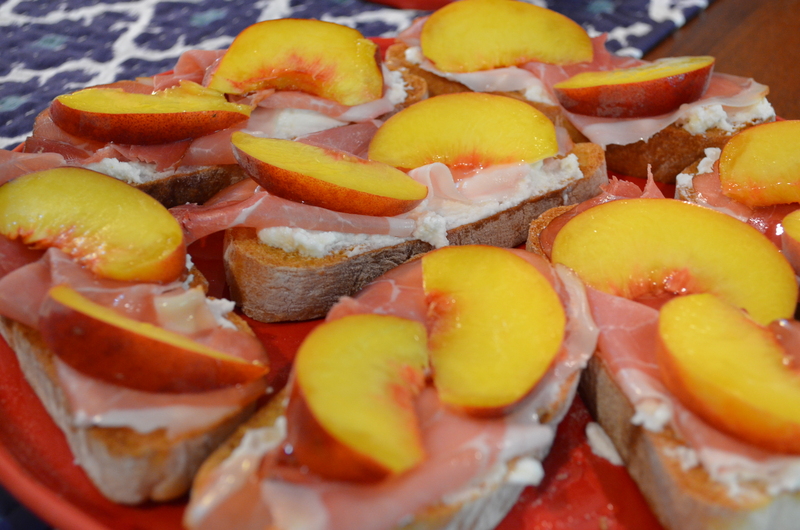 The first, as I already wrote about, was the peach, ricotta crostini appetizer (which as I previously mentioned was delicious!). 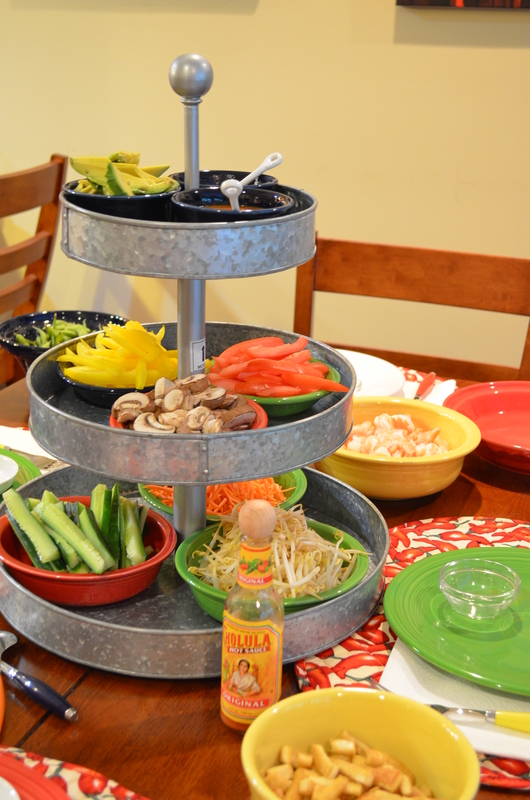 The picture below is how I set the table for the ladies and gives you an idea of what all I include in my spring rolls. Below is my attempt at a recipe. With this dinner, I also served edamame and Trader Joe chicken gyoza. Overall, I think this meal was a big hit. And I love when there are leftovers as it makes a great salad the next day! Hope you are all doing well! Have a great day! Last night was crazy! Between working until after 6:30pm, rushing home to walk Leo and rushing straight to my condo Board meeting at 7:30pm, I didn’t have much time for dinner. In fact, I didn’t even get to think about dinner until 8:45pm when I got home from my Board meeting! Sorry, got distracted, back to dinner…after looking in the fridge for inspiration I decided I again needed to do something with peaches as we have a lot and a few are getting SUPER ripe! I know, hard to have to eat peaches 🙂 I also noticed we had some pita bread in the fridge that really, really, really needed to be used. Based on those two items it all of a sudden hit me…Peach Pita Pizza!!! I have been wanting to make a peach pizza for a while now. I saw it on Pinterest a few weeks back and ever since it has been on my mind so last night was my chance. Well, OK, it wasn’t really pizza, however, it was a pizza style dish. Here is a picture I snapped on my phone of how dinner turned out. Not the best picture but it gives you an idea of what it looked like. See below for my recipe. Instructions: Preheat oven to 350 degrees. Spread ricotta on pita and top with peaches. Drizzle a little bit of honey over peaches and pita. Cook for 5-7 minutes or until heated. Top with basil. I wasn’t sure how this was going to turn out, but thankfully it was good! Felt like I was having dinner and dessert all at once! This was super easy and quick. I think it took me about 10 minutes in total (not counting the time it took me to figure out what the heck to make). If you want a quick easy dinner, I highly recommend giving this a go. I still want to try an official Peach Pizza one of these days but until then this totally hit the spot! Anyhow, back to the dinner and the reason for this post. I am actually going to split it into two posts. This one is all about the appetizer. Based on how it turned out, I felt it deserved its own post! All I can say is you must try this appetizer. One word describes it – incredible! It is melt in your mouth amazing! And, it is SUPER easy! Directions: Grill bread slices (note: I lightly brushed each of mine with olive oil, however, this is not necessary, and then put them on a baking sheet under the broiler for about 5 minutes flipping once). Halve, pit, and thinly slice each peach. Combine ricotta, lemon juice and about 1 teaspoon (or to taste) of honey. Spread about 1 tablespoon (or a little more) of the ricotta mix onto each piece of bread. 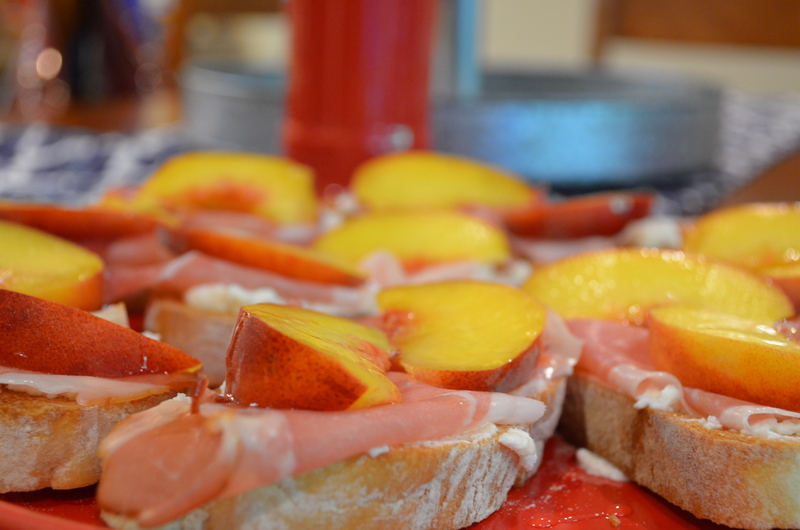 Top with a slice of prosciutto and 2-3 peach slices. Drizzle each with honey. Enjoy! I loved these so much that last night for dinner I made a few for myself. They worked perfect as a meal!!! And was excellent with a glass of Malbec 🙂 The only change I made was I used a nectarine instead of a peach. It was just as delicious! Be back later with a post on the dinner I put together! Have a great day! Anyhow, now for the point of this post, a while back, when looking for food ideas for a 4th of July party the hubs and I were attending (yes, I know that was forever ago), I came across a fun twist to brownies on Pinterest and I knew immediately that I had to try it! 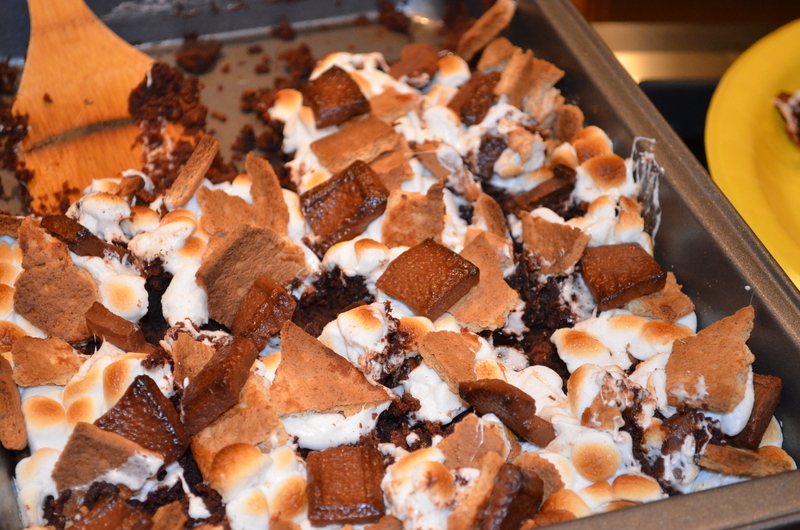 They were S’mores Brownies. Let me tell you, amazing idea, and they turned out amazing as well. I just love what people come up with. And thank goodness for Pinterest as it makes my recipe hunts so easy! Don’t they look yummy??? Directions: Preheat the oven to 350 F. Spray 9×9-inch baking pan with non-stick cooking spray. Prepare the brownie mix according to the directions on the box using the oil, egg, and water. After baking, remove the pan from the oven and set the oven to broil at 500-550 F.
Cool brownies for about a minute then sprinkle the marshmallows over the warm brownies. Make sure to cover most of the area. Sprinkle the graham crackers on top of the marshmallows. Broil about 4-5 inches from the heat for 30 seconds to a minute until the marshmallows are golden brown. Watch carefully so that they don’t burn. Sprinkle with Hershey’s milk chocolate bars. These were a huge hit at the party we went to! I didn’t follow the directions above completely. Instead, I made the brownies in the morning before the golf tournament we were in that day and then when we arrived at our friends home, I added the marshmallows, graham crackers and chocolate and broiled right before dessert time. Sadly, my brownies were a little crumbly…not sure if it was the mix I chose or if I didn’t bake properly, however, despite them being messy, they still tasted delicious! Is It Possible…A Healthy Cookie??? 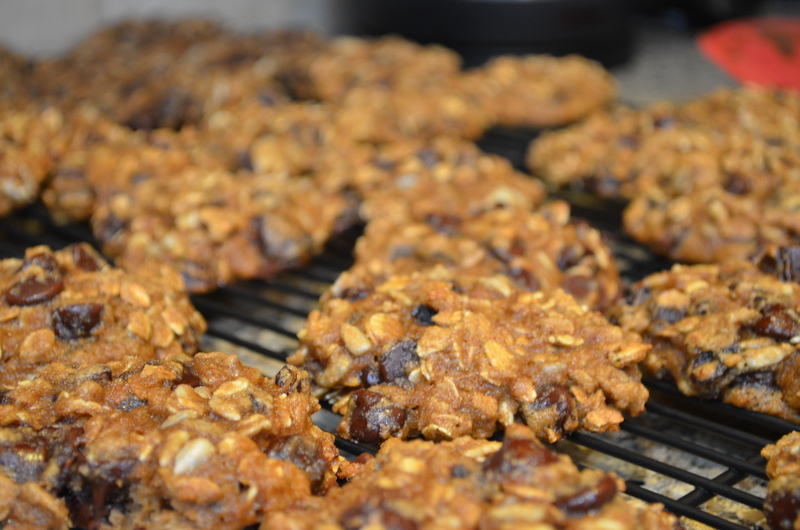 I do think it is possible that a cookie can now be “healthy”…well OK, so maybe not healthy but the cookies I am writing about in this post are as close as you are going to get! In my opinion, these cookies are a must try! They were delicious! I brought some on the boat with us for Seafair and they were well liked. And, as I was eating way too many at home I brought a lot in to work a few days later and they were gone by the end of the day! People devoured them. Directions: Sift flour, baking soda, and salt together and set aside. Blend applesauce, sugar and vanilla together. Beat in egg. Add flour mixture and mix. 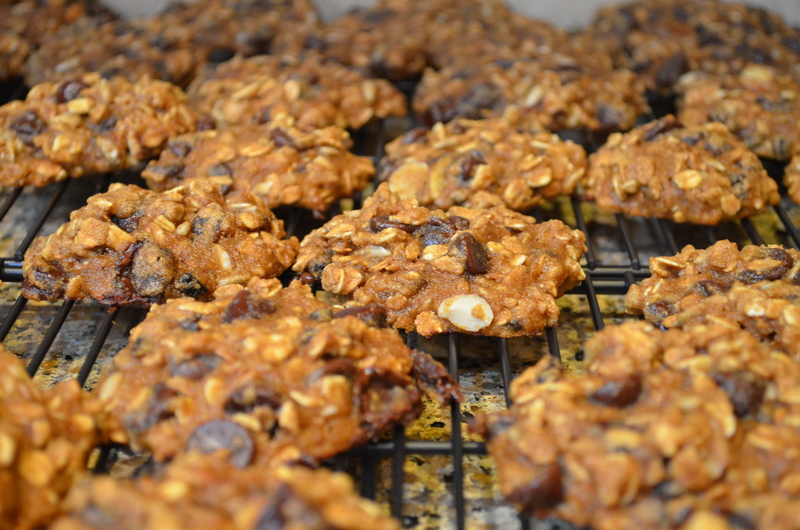 Stir in Muesli and chocolate chips. Drop by tablespoons on lightly greased cookie sheet. Bake at 375°F for 10-12 minutes. Makes 24 cookies. Last night I really, really, really needed to use up some green bell peppers that we had in the fridge. They were almost to the point of having to toss but not quite yet there. Although I was really craving going out and having a Queen Margarita Pizza (if you haven’t been this is a great little pizza place in Magnolia), I knew I needed to force myself to think of something to do with them! Not sure why, but I am so bad at using up bell peppers even though I love them! Overall, I say they turned out pretty dang good. My only comment while eating dinner was “I could have probably cooked these a little longer.” Although the pepper was cooked, it wasn’t as soft as I would have liked. Oh well, it still tasted good. And, as the Mr. ended up eating at church at the Community Dinner that was taking place while he was volunteering at the food bank, we have TONS of leftovers that will work for lunches the next few days. In fact, it I had one today and it reheated very well! 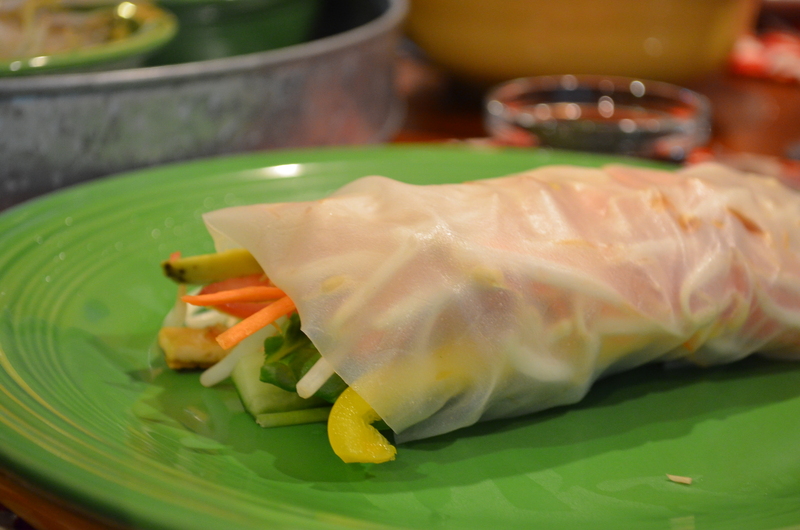 I am impressed with myself – I took a lot of stuff we had on hand and came up with these…don’t they look yummy??? Heat oil in saucepan over medium heat. Saute onion and celery for about 5-7 minutes, or until soft, then add cumin and garlic and cook for an additional minute. Stir in drained tomatoes, chicken and black beans and cook for 5 minutes until most of the liquid has evaporated. Stir in rice & quinoa mix as well as 1/4 cup of cheese and season with salt and pepper, if desired. Preheat oven to 350 degrees and pour reserved liquid from tomatoes in the bottom of your baking dish along with 1/4 cup tomato sauce. 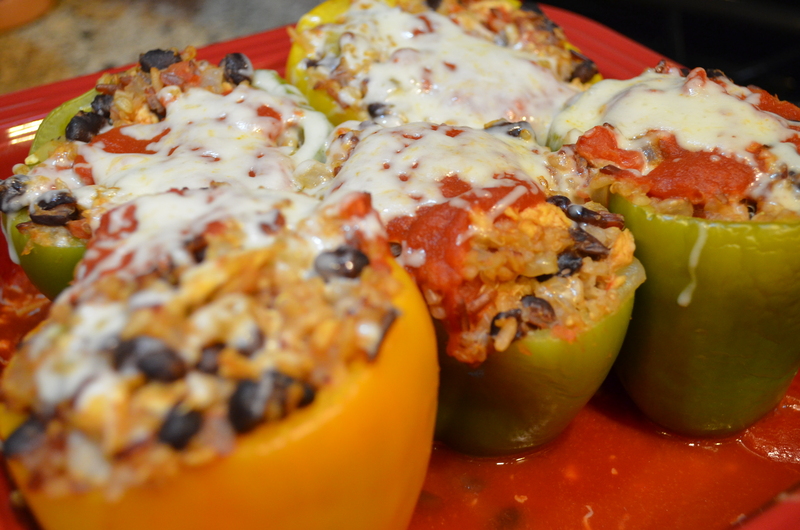 Fill each halved bell pepper with rice & quinoa mixture and place in baking dish. Top each pepper with 1 tbsp tomato sauce. Cover with foil and bake 40-50 minutes. Remove foil and top with remaining cheese. Cook until melted. 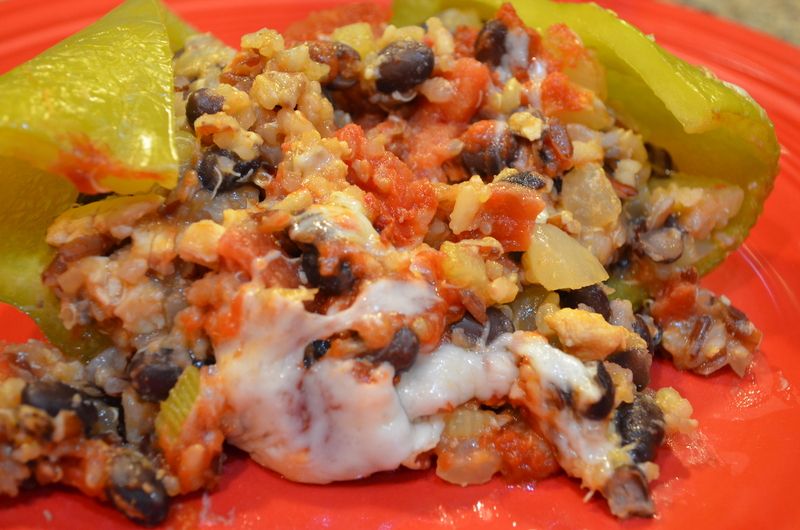 Transfer stuffed bell peppers onto serving dish and drizzle pan juices over top. I recommend giving these a try. If you aren’t able to get the Costco mix we used, regular quinoa or rice would work just fine! Enjoy!